to tell your story and grow your brand. …in the swamps of Broward County Florida, Jon & Melissa had an idea. You see, Jon worked at a big marketing agency who only took clients with big pockets. Melissa, an academic with a passion for local community, taught at the university and volunteered on a live local project in West Broward. Both were frustrated with the difficulties faced by local businesses, who just couldn’t keep up with the big budgets of the biggest national brands and were falling noticeably behind in online marketing. Jon & Melissa thought, “heck, why don’t we combine our passion and expertise and just start our own agency?” The idea was cultivated to provide big agency marketing to the local community at more affordable small agency prices. On one hand, Jon would get to code awesome websites and design creative campaigns. On the other, Melissa would get to continue her research and work hands on to grow local businesses. In 2012 Jon & Melissa launched Five One Digital, ready and armed with the tools to offer big agency services, like rich marketing campaigns and advanced web analytics, at reasonable prices that fit local business budgets. 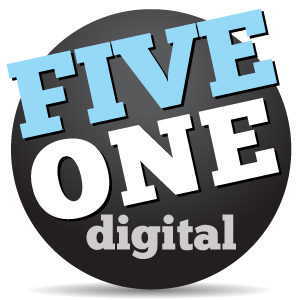 Thanks to a couple of clients early on that took a chance on an unknown agency, Five One Digital grew. Their mission stays the same today, and they continue to provide quality designs, innovative web development and creative marketing strategies to growing businesses in our South Florida community. Focusing on user experience & front end development, Jon’s been in the advertising world since he graduated from the University of Miami in 2007. Having worked with regionally focused agencies and large, international firms, he has experience providing services for local small businesses and global Fortune 500 brands. Although he primarily designs & codes online campaigns, Jon studied motion pictures in school and has plenty of professional experience in editing videos for broadcast (commercials, PSAs, etc.) & building animated motion graphics. With a passion for community development, Melissa provides a unique approach to the marketing world as an academic. She leverages analytical research skills with unique perspectives of logistical processes, working closely with clients to develop innovative approaches to market research & campaign planning. An FSU undergrad, Melissa studied historical urban planning & strategies in grad school at FIU, teaching at the university for several years. She’s active in her community & passionate about growing a stronger live local movement in South Florida. we’re proudly active in our South Florida community. We provide services to companies & brands across the country, but we love working with our neighbors. We grow community by giving local businesses the marketing tools & strategies they need to flourish. The strength of our local businesses reflect on the strength of our community. This is why we started Five One Digital. When at all possible, our motto is #LiveLocal. We believe in this so strongly, we’re launching a website called LiveLocalBroward.com (previously fiftyonein.com) to promote locally owned businesses in Broward County. It is a free service to help highlight local business choices in our community. Launching this summer, watch for announcements on Facebook or Twitter. Are you one of these businesses? We’re growing with our neighbors and are proud to serve the very same business owners we tailgate with at Sun Life Stadium. If you’re interested in getting involved with Live Local Broward or want to talk about your next marketing project, please contact us. Visit us on the Orange Pages (link below) for a special promotion for our fellow Miami Dolphins season ticket holders!